Happy Saturday everyone! This week's shop is Doll Birdies. Doll Birdies makes fun and whimsical bags that can be used for a variety of purposes. 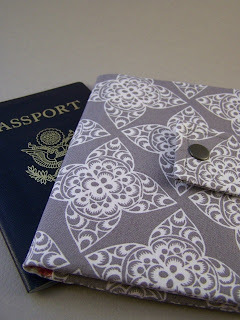 Doll Birdies will be giving one of this week's winners a passport wallet cover. Here's the piece that I was loosely inspired by, what can I say? Sometime's I get a little off the page. Our sponsor this week is SRM Stickers. SRM Stickers are widely used by many paper crafters and it has a blog every weekday with many paper crafting projects using stickers. Become a follower of their blog so you don't miss any tutorials, challenges, features or giveaways. They are giving our second winner a prize pack of stickers! So, now it's your turn to play along. Make sure to visit the design team's blogs to see their BEAUTIFUL projects so that you can get inspired to create a fabulous project of your own! 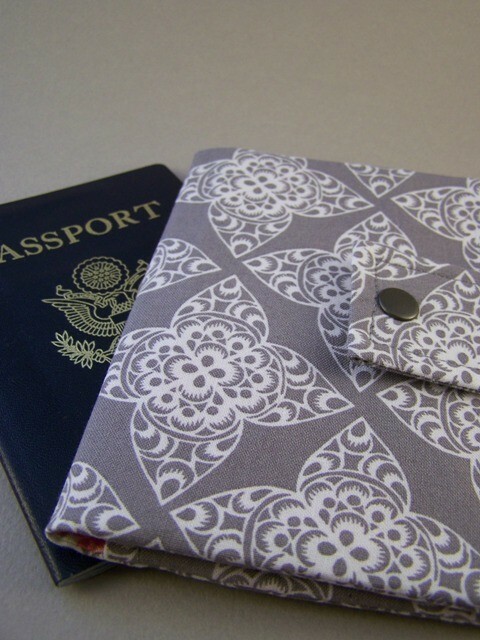 Make sure to post your design to the Etsy Inspired Challenge Blog by Friday, March 11th at noon! Cardstock: (Aqua Mist, ) PTI. Patterned Paper: (Portrait collection) Crate Paper. Fibers: (Gray seam binding) Prairie Bird Boutique. (Gray and white string, Yellow Crochet) May Arts. Clear Stamps: (Silhouettes) Maya Road. 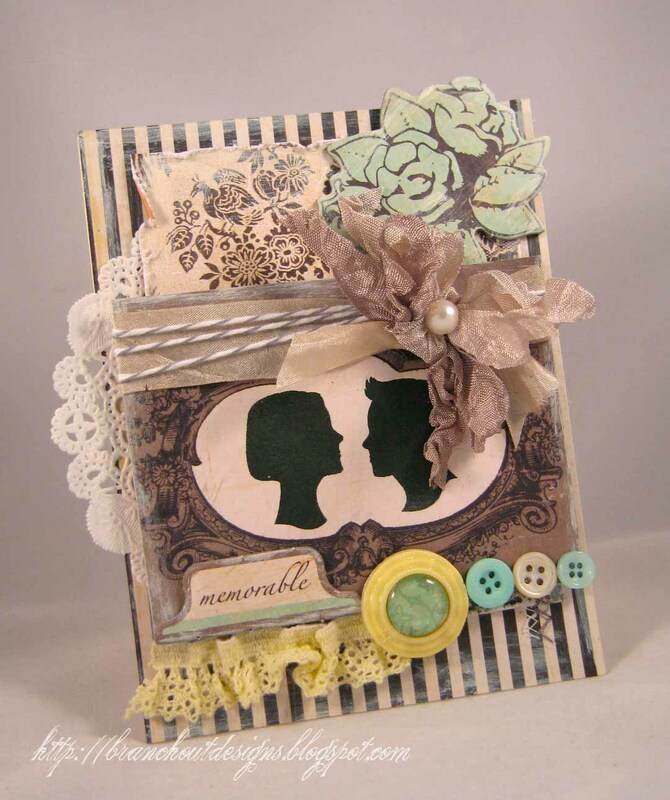 Accents: (Chipboard flower, tab from Portrait collection) Crate Paper. (Aqua blue buttons) PTI. (White vintage buttons) (Epoxy and setting) Epiphany Crafts. Other: (White paint) Delta. (White doily) Wilton. As always, a beautifully detailed card! Gorgeous! Wow! I am always truly blown away everytime I see one of your creations Emily!! This is just absolutely gorgeous...LOVE IT!!!!! WOOOOOOOW! I am always in love with your creations! 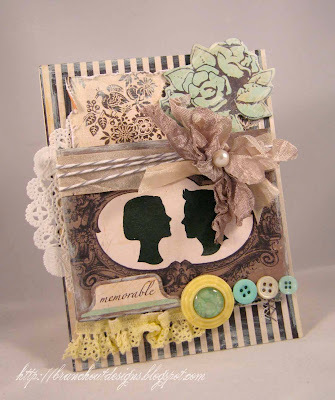 I love this very layered card! I love love love those silhouettes, the twine, the seam binding, those buttons...the lace...the doilies! OH MY! I just love it all--beautifully done, Emily!! Love this sweet and romantic card, Emily!! The images and elements in this card are gorgeous!! Love how you were inspired! This is soooooo fabulous! I love the flower, doily, buttons and everything! Just perfection, Emily! thank you for sharing your lovely art! Stunning is exactly the word that came to mind when I saw this! :) LOVE IT!